From the pew to the... speakerThe Church of England is offering worshippers the chance to use voice-activated virtual assistants to pray.People can ask Amazon's Alexa device to read a prayer of the day, the Ten Commandments or the Lord's Prayer or to recite grace before a meal. 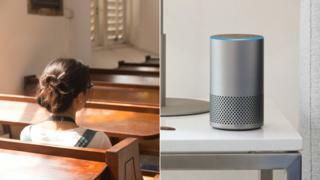 But the smart speakers will also have a "church near you" function to encourage people to visit their local church.The move is part of an online campaign by the Church after figures showed fewer people were attending services.The Church of England also hopes to also offer the service through Google Play in the future. Church figures for last year showed the Church was reaching 1.2 million people online every month but that those attending Sunday services had dropped by 14% since 2006. What can a worshipper ask Alexa? The Church of England said it wanted to use all of the technologies available to grow people's faith and had noticed the popularity of the speakers.There are also plans to mark key events in the Christian calendar including Christmas and Easter using the technology.In March the Church announced it was to begin taking contactless payments for services such as weddings and christenings at more than over 16,000 churches - a move it said should appeal to young people who often did not carry cash. » Can social media boost the Church's congregation?